“Today’s going to be a different kind of event,” CEO Tim Cook opened today’s Apple event. Why? Because the event centered entirely on services rather than products. Today Apple revealed a new Netflix-for-magazines subscription service, a new Netflix-for-games service, a service that’s basically just another Netflix, and, on top of all that, their very own Apple credit card. You already know and rely on plenty of huge Apple services: Siri, Calendar, Find my iPhone, Podcasts, Apple News, and, perhaps most importantly, Google Maps. Here’s how they’re adding more as Apple charges ahead on its pivot to services. Apple News, the company’s now three-year-old news service, is getting an upgrade with a Plus sign. Magazines are coming to Apple News for the first time, in a subscription service that will be called Apple News+. Categories include Top Stories, Trending Stories, and a section tailored to each specific user. 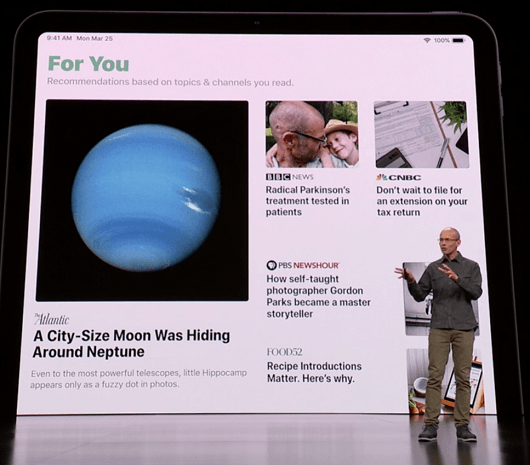 300 major magazines are partnered with Apple for the service, including entries as varied as National Geographic, Wired, The New Yorker, the LA Times, the Skimm, Vox, the Wall Street Journal, and Popular Science. Your favorites will auto-download, so you won’t need to remember to pre-download anything before boarding a plane. In all cases, the design and typography of each magazine will adapt to the device being used to view it, from smartphones to tablets. The best mobile magazine experience ever? That’s what Apple’s hoping for, to the point that they used that exact phrase multiple times in the presentation. One big reveal: Apple won’t let advertisers track you (This got a round of applause at the event, which tells you where everyone’s mind is on the subject of security and privacy). One note that the event didn’t make fully clear: How much content each magazine partners will make available to the service. An internal Wall Street Journal memo, for example, notes that Apple News+ users will only get a “curated collection of general interest news,” while an Apple exec has stated that the service will get all the Journal’s content. Sort it out, folks. The service costs $9.99 per month and will be available to an entire family under one subscription. It’s available today in the U.S. and Canada, and the first month is free. Apple’s bid to replace the wallet is seeing success: They’re on track to pass up 10 billion Apple Pay transactions across 2019. The service will be available in more than 40 countries by the end of the year as well. Now they have a new service: Apple Card. 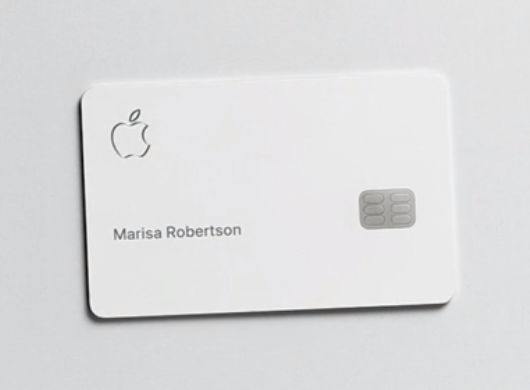 That’s right, Apple is creating its own credit card. You’ll be able to use it with Apple Pay worldwide. You’ll get 2 percent of your credit card purchases back in “Daily Cash,” a same-day delivery of money into your account. That number becomes 3 percent when you’re buying from Apple. And the card is made out of laser-etched titanium, naturally. The Apple Card service will use machine learning to better track your location and purchases so that you’ll understand your transaction history. It’ll also help you better understand your overall spending habits. Also, there’s no late fees, no annual fees, no international fees, and no over limit fees. Again, Apple notes during their event that they’ll never sell data for marketing or ads, and they won’t even have access to data on how much you’re paying for what. 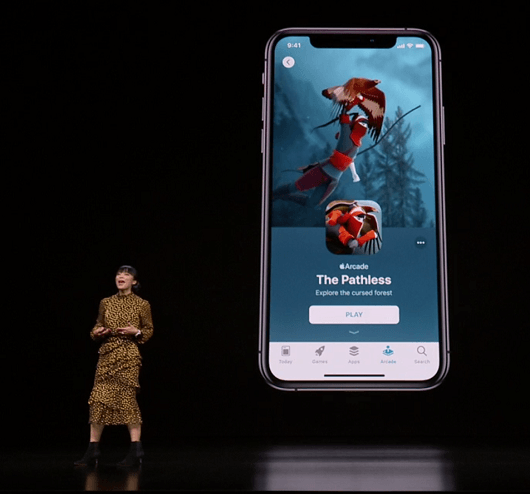 Apple’s crack at the popular Netflix-for-games niche is Apple Arcade. Over 100 new and exclusive games are available on the service at launch, and it’s all available offline as well. Your account will update game play across all devices, letting you pick up where you left off. Once again, it won’t collect any personal data without your consent, and it’ll be available to an entire family at a time. Pricing isn’t announced yet, but it’ll be available in Fall 2019, in over 150 countries and regions worldwide, so we’ll learn how much it all costs at some point before then. It’s an interesting entry in the game streaming service battle, but it’ll have competition: Google’s own service, Stadia, was announced just days earlier. Inside the new Apple TV app, you’ll be able to only pay for the channels you want, using one account. Download shows, enjoy a high-quality image, and bring in the entire family. A “Kid’s Experience” section includes children’s TV options. It’s “a safe place to explore together,” the event mentions, in a (kinda) subtle dig at YouTube’s recent troubles with children’s content. Apple TV app is coming to the Mac in Fall 2019 for the first time, and it’ll be on smart TVs too, starting with Samsung this Spring, and including LG, Sony, and Vizio later in the year. It’ll be on Roku and Amazon Fire TV as well. 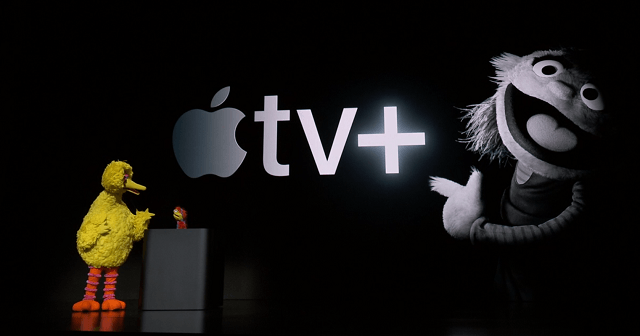 Oh, and Apple is also launching its own Netflix killer, a streaming TV media enterprise called Apple TV Plus. The service will include a TV show adaptation of the old sci-fi magazine Amazing Stories helmed by Steven Speilberg; the Morning Show with Reese Witherspoon, Jennifer Aniston, and Steve Carell; a sci-fi show about a world in which no one can see; Little America, a show written by and centering American immigrants; and an initiative led by Oprah Winfrey, among others. The service will stream Oprah and a book’s author in conversation, live, as part of what sounds like the coolest book club in 2019, a year that’s already seeing a book club revival. 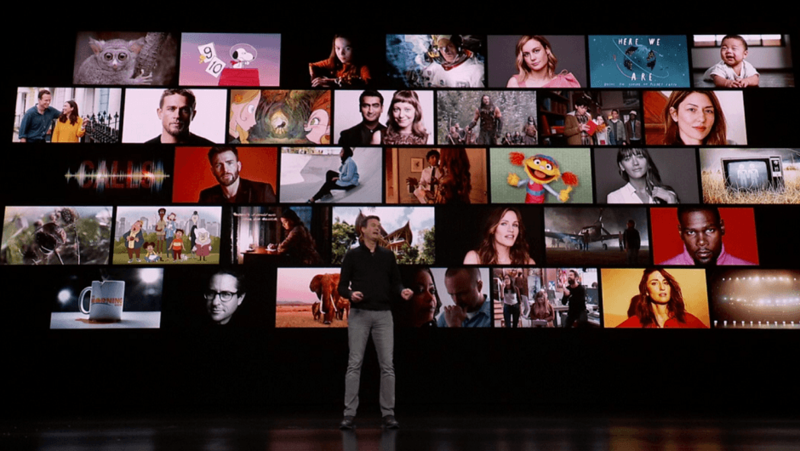 Apple TV Plus is ad-free, with new additions monthly, available in over 100 countries and starting in Fall 2019. Sadly, pricing details are not yet available. Critics remain skeptical of the service’s offerings, however: “Shonda Rimes and Ryan Murphy to Netflix is more important than the sum of what Apple is announcing” a former Disney interactive media group strategist tweeted. But at least it’s not every day that you get to see Steven Spielberg, Sesame Street’s Big Bird, and Oprah in person at the same event. We’ll hold out judgement until we can see all the trailers.